Facing throngs of seasoned and fresh victims alike this 2009 season, haunted attraction owners, producers and make up departments are looking for new chills, creeps and creatures to leap from the nighttime shadows. A fresh new look, for a familiar character, will be transforming scare-actors and scare-zones in scream parks and haunted houses across the country this Halloween into rampaging werewolves. 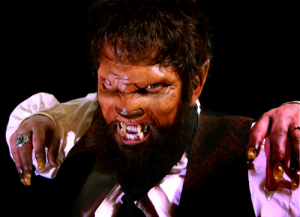 According to Jason Grimm, of GrimmBrothersHalloween.com, there is no need for ancient curses, wolfsbane or full moon light to transform you or your haunt actors into something not quite human, with the exclusive Grimm Brothers Big Bad Wolf Foam Latex Werewolf Appliance. Busch Gardens Howl-O-Scream in Williamsburg, Virginia, and Thrillvania Screampark in Dallas, Texas are among the national attractions that have chosen the Big Bad Wolf as the unsettling face of their 2009 season werewolves . The Big Bad Wolf is a re-imagining of a well-known face to pop culture and movie fans, yet new and unfamiliar to many haunted attraction patrons. It provides a horrific transformation into a life-like, believable character to scare and interact with the patron and just the right amount of animal rage for the haunter who has a love for lycans. Custom sculpted in the tradition of Lon Chaney Jr.’s classic wolf man, the professional appliance strays from the more wolven looks of recent werewolf masks and popular film, back to the canine-cursed features of the traditional man-wolf. In designing the appliance with realism in mind, cut away cheek areas, covered by many other appliances, allow the actor wearing the piece to incorporate natural facial hair or a beard to add to the realism of the look with little additional theatrical hair. Details are expertly sculpted and cast in high-quality foam latex for extremely life-like textures, expression and . The Big Bad Wolf is made in the USA exclusively for Grimm Brothers. This appliance is available through Grimm Brothers Halloween online at www.GrimmBrothersHalloween.com.